Note: Only follow focus, camera and other shoulder rig are not included. 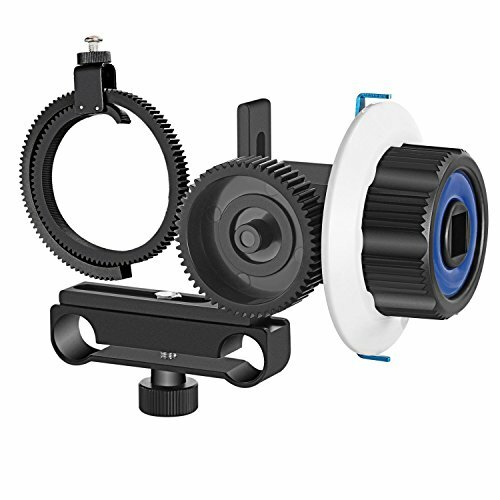 This follow focus is compatible with Sony Nikon Canon and other DSLR Camera Camcorder DV Video; And it fits industry standard 15mm rod mounts and 60mm center to center distance. It can be easy to mount and take down; Using gear drive can adjust camera focus in a more accurate and smooth way. Its gear ring belt is suitable for less than 100mm diameters lens. Non-slip design with grooved knob; The white mark ring is made of plastic and it can be used to mark the scale on follow focus. It is great for follow focus shooting.